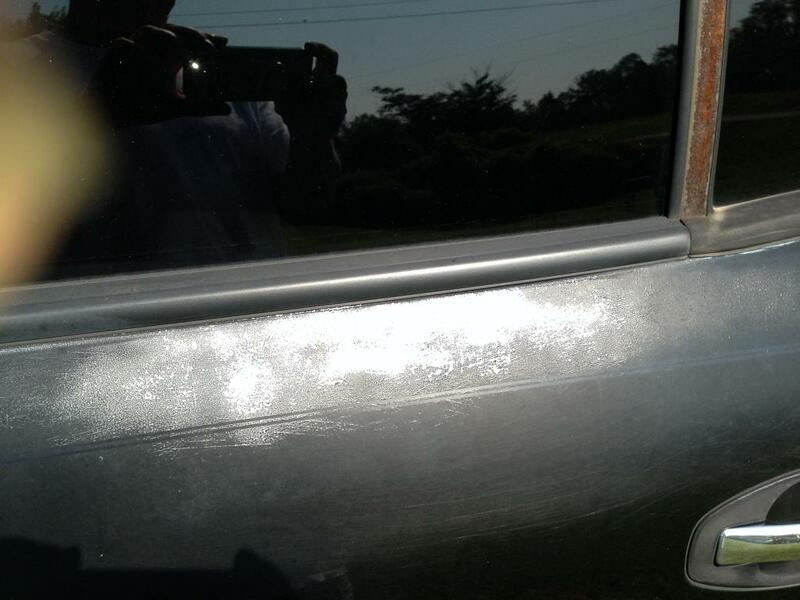 paint peeling all over car back sides hood doors needs to be repainted. I bought my car new and I still love it! The paint began going bad in less than 10 years. I was not aware of how bad it was for a few years. But then I started seeing other Santa-Fe's with the same problem. Looking it up on line, I saw that this was a problem with the cars because bad paint was used in the early 2000's. The paint is not peeling, it is wearing off. My car and most of the other cars I notice with this problem are dark colored and so it is very obvious. My car looks awful outside but still runs great. It just went over 100,000 last year, 13 years old. It would be great if Hyundai would re-paint it. I am not in the position to buy a new or newer used car. I will take some pictures and upload them as soon as I can. 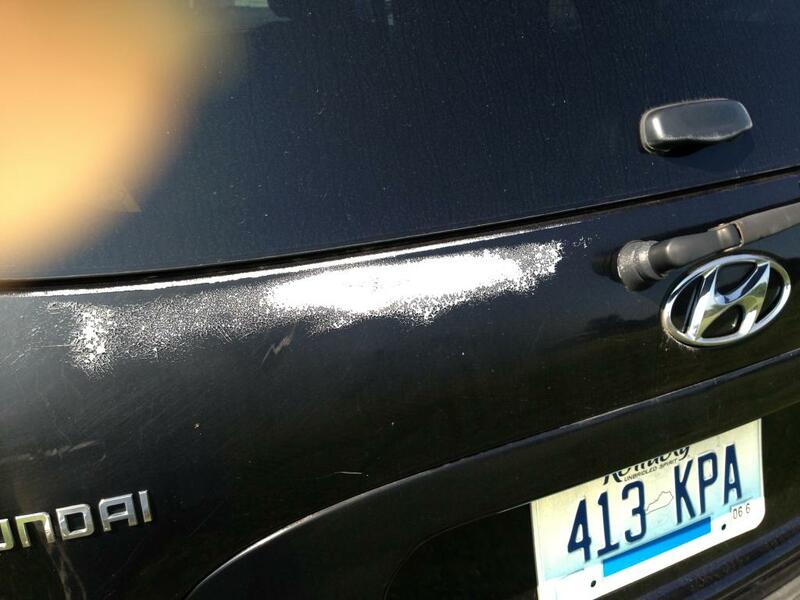 Serious problem with clear coat peeling off about 30 percent of the vehicle now. what kind of paint did they use on these cars..... HORRIBLE!!! I've had engine problems, brake problems, wheel alignment numerous times (twice in one year) I don't think that's right but who knows..... all together a piece of sh*t car!!!! Car should be worth about $2100 for the miles and mechanical condition it is in. However, I won't be able to get over $1250 now because the paint is completely fading and peeling away. This makes the car significantly less valuable. I would like it fixed! The vehicle looks like crap because of it. The paint on this vehicle is terrible. I have never seen paint just peel and wear off. This is only one of the multiple problems I have had with this suv. I will never buy another Hyundai product again. 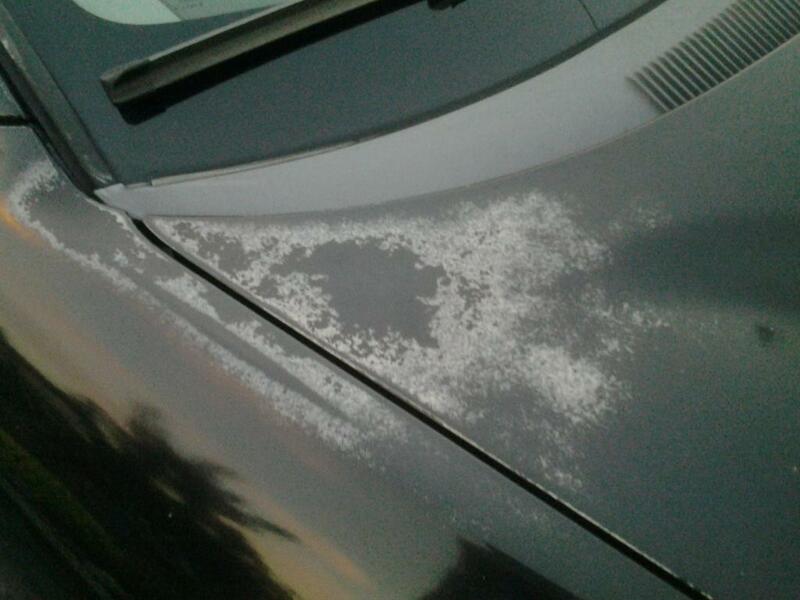 The clear coat basically turned white and began flaking off on all of the car surface. This looks horrible on a black vehicle. I had most of it repainted by the dealer in April 2012 but the rest of it needs repainting now. I've never had this happen to a car that I've owned before. 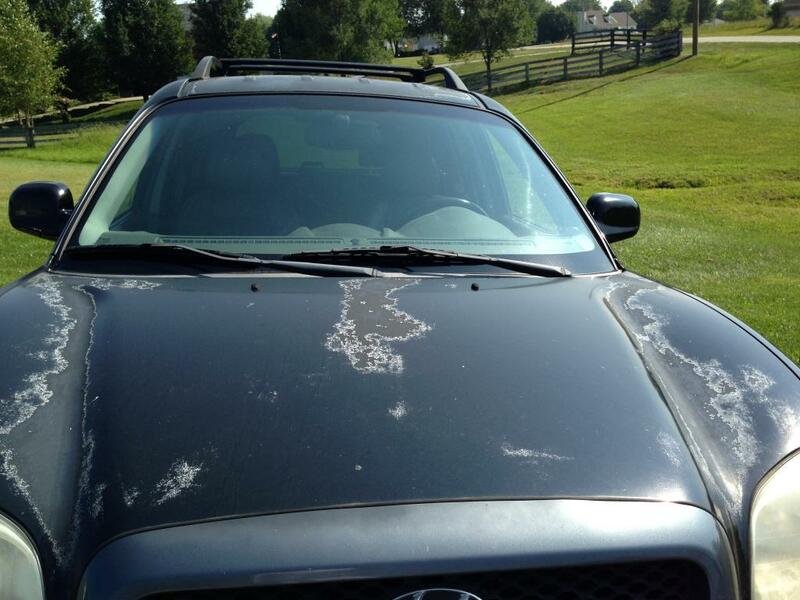 From 12/2004 to 6/2008, I resided in Michigan where the sun isn't really a problem for cars -- only rust is. From 7/2008 to the present I've been in New Mexico where rust isn't a problem but the sun is. 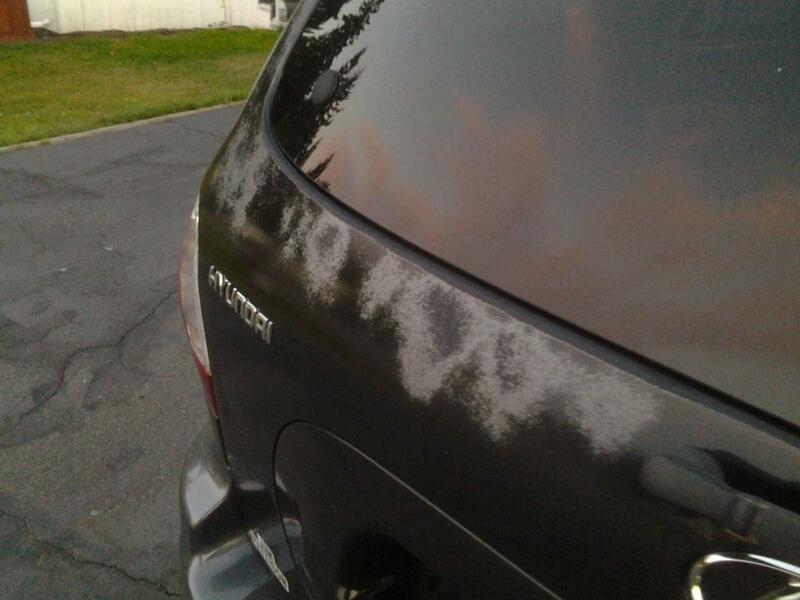 For most cars, this just means a faded finish but for the Santa Fe, it meant destruction of the clear coat. I think it's a defect but Hyundai disagrees. The car hasn't had much go wrong with it though besides the paint and I'm at 108K miles. The problem has gotten worst over time. The paint looks awful but I can not afford to get it repainted. I have talked to other owners of the same model and color and they too have the problem. I feel this was a manufacturing problem that they did not recall and fix. I will not buy from them again. I also had to have a new A/C compressor a month after my warranty expired, about 60,000 miles. At 65000 miles both my front windows would not work. Estimated cost about $1000 for parts and labor. This seems to be a huge amount of high cost problems that should not have happened at 65000 miles. The paint job on my Santa Fe is ridiculous. The only place on the car that the paint has stayed on is the back hatch. Everywhere else it is pealing off. Mine is not the only. I see other Santa Fes driving all the time with the same problem. I really think the company should have to fix this. It makes it so hard to resale and the value drops with a bad paint job. I really wonder if their is any chance a new paint job is in my future for my car. 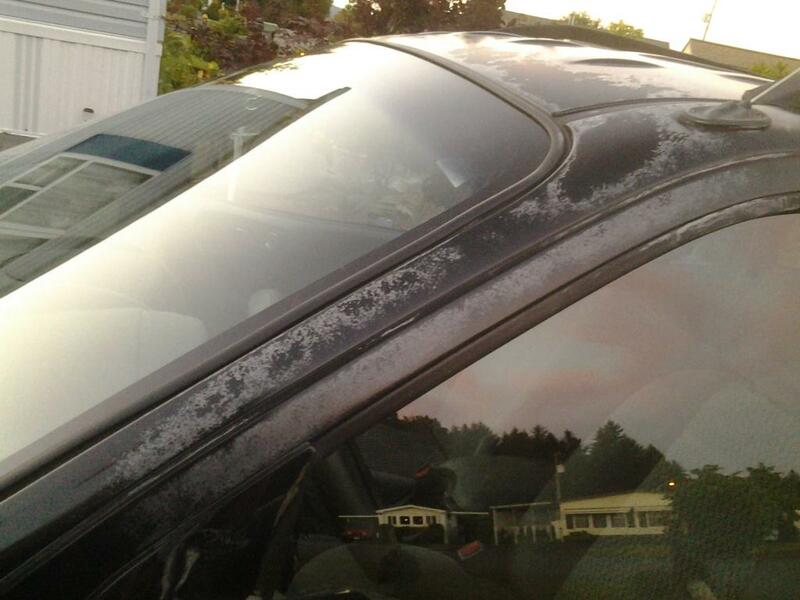 I bought this car new in 2004 with a $1200 "lifetime" guaranteed paint and clear coat protection plan. About 2 years ago I noticed the paint beginning to flake and it now covers about 40% of the body. So far Hyundai has failed to be of any help at all. I first noticed the paint on the roof was wearing thin. Gradually the paint has failed on the fenders, hood, and the upper part of the doors. It shows up as white dots and now has completely oxidized. My car is garaged when not in use and has been waxed often.